FIRE (Flight Investigation of Re-Entry) was a high-speed reentry heat research program to obtain data on materials, heating rates, and radio signal attenuation on spacecraft reentering the atmosphere at speeds of about 24,500 miles per hour. FIRE was a subscale model of the Apollo capsule used to verify the spacecraft's hypersonic flight and thermal characteristics. Data from the program would support technology for manned and unmanned reentry from lunar missions. Under the management of the Langley Research Center, Project FIRE would use an Atlas-D Antares-2 (Atlas D booster and the reentry package powered by an Antares solid-fuel motor). NASA announced that a $5 million contract would be awarded to Republic Aviation Corporation for the construction of two experimental reentry spacecraft. Republic was selected from eight companies that submitted bids on March 12. The contract was part of Project FIRE, to develop a spacecraft capable of withstanding reentry into the earth's atmosphere from a lunar mission. Plans called for the spacecraft to be tested during the second half of 1963. RCA was selected to build the data acquisition and communications subsystem and Ling-Temco-Vought to develop the velocity package for Project FIRE. An Atlas D booster would lift an instrumented payload (looking like a miniature Apollo CM) to an altitude of 122 km. After coasting to an apogee of more than 800 km, the velocity package would then FIRE the reentry vehicle into a minus 15 degree trajectory at a velocity of 11,300 meters per second. An Atlas D launch vehicle lifted a Project FIRE spacecraft from Cape Kennedy in the first test of the heat that would be encountered by a spacecraft reentering the atmosphere at lunar-return velocity. During the spacecraft's fall toward earth, a solid-fuel Antares II rocket behind the payload fired for 30 seconds, increasing the descent speed to 40,501 kilometers per hour. Instruments in the spacecraft radioed temperature data to the ground. The spacecraft exterior reached an estimated temperature of 11,400 K. About 32 minutes after launch, the spacecraft impacted into the Atlantic Ocean. 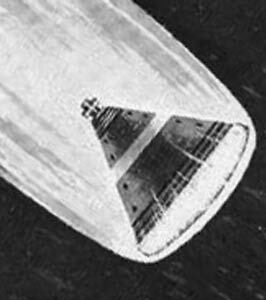 The mission, sponsored by Langley Research Center, provided reentry heating measurements needed to evaluate heatshield materials and information on the communications blackout during reentry. During the second test, an Atlas D booster propelled the instrumented probe, called a "flying thermometer," into a ballistic trajectory over 805 km high. After 26 minutes of flight, when the spacecraft began its descent, the Antares rocket accelerated its fall. The probe entered the atmosphere at a speed of 40,877 km and generated temperatures of about 11,206 K. Data on heating were transmitted to ground stations throughout the descent. Thirty-two minutes after the launch - and but six minutes after the Antares was fired - the device impacted in the Atlantic about 8,256 km southeast of the Cape.